I really should have already been back in London by now, but a message from Tim and Lesley to say that they were going to make an end of season trip to Morzine, provided a great reason to get in a final group ride of the season. 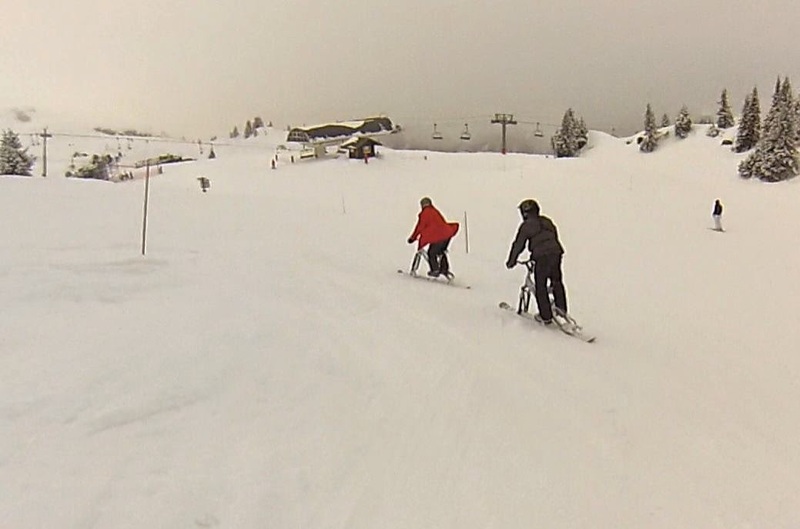 I last rode a skibike with Tim over 18 months ago at the Bottrop indoor ski centre in Germany, at the time he was testing out a Lenz Brawler that was for sale and hasn't been on a skibike since. I had hoped to get him on my spare skibike for the day, but it turned out he has only recently had an operation on his hand which is taking a long time to heal up. If you have trouble even getting your gloves on, then lugging a skibike on and off sundry chairlifts is probably not a good idea. In the last few weeks I seem to have spent the majority of my time playing catch up with the other skibikers. But today Lesley got a bit intimidated by the odd mix of ice, slush, grass and rocks found on some runs and took a highly cautious approach; whilst I enjoyed the luxury of being able to jump off my skibike and carry it over the muddy bits and had the rare pleasure of being first down the slope. This of course meant I could take a breather in the hot sun and field curious bystanders' questions. With slushy conditions predominating from noon onwards I witnessed the build up of a great deal of "saddle envy" whilst making jet ski style progress through all the slush. I left Tim and Lesley to head back to their chalet in Morzine with tired legs, whilst I indulged myself in some solo rides till the last lift closed. 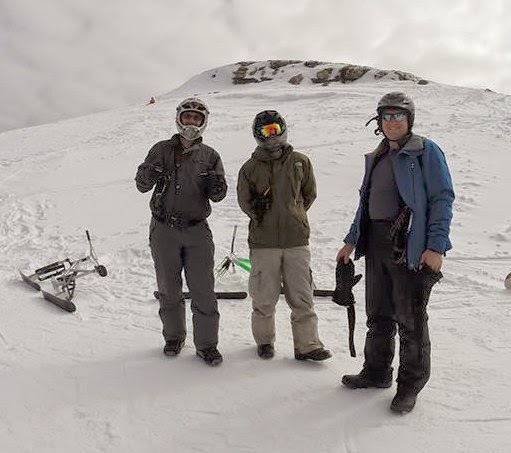 This year has been the first time someone has made me an offer I couldn't refuse and no the Mafia weren't involved, it was the chance to hang out in the company of fellow skibiker John in Les Menuires to do some easy riding all around the 3 Valleys domain. Les Menuires was much maligned back in the day, mainly for the brutal and ugly nature of the first wave of architecture. Since then development has been more sympathetic to the environment and recent structures have been of the chalet and super-chalet design. Les Menuires is part of the 3 Valleys domain, an interlinked area of gargantuan proportions; there may be areas of a similar scale in Austria and Italy, but in France it is without equal. 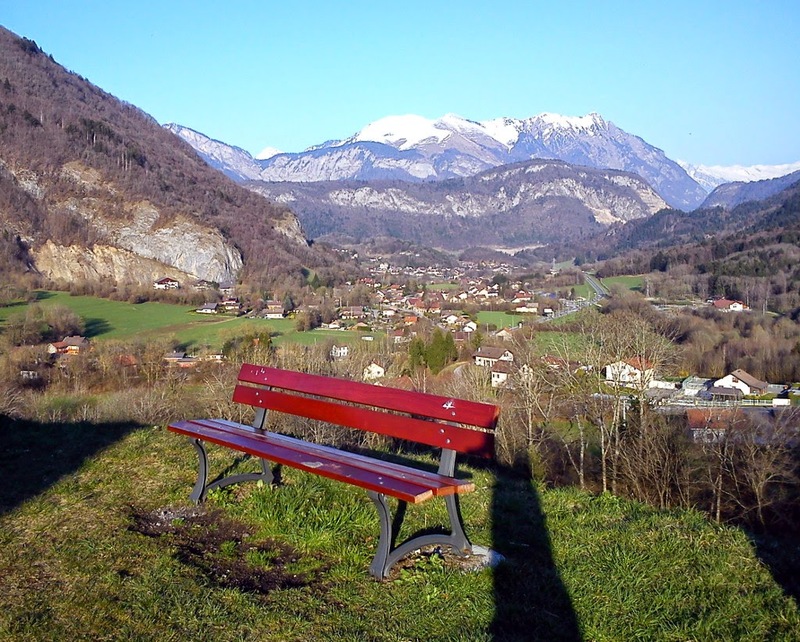 Each sector of the 3 Valleys have their own character and appeal to widely differing consumer needs. 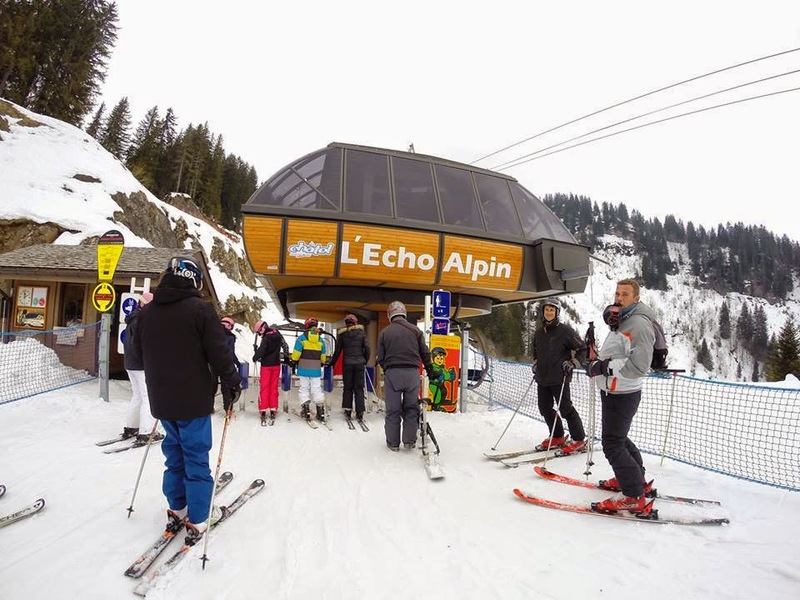 Whereas Courchevel may now be the second home of Russian Oligarchs, Les Menuires appeals mostly to French visitors who take advantage of the plethora of self-catering apartments available. I had a great time touring round all the nooks and crannies of the 3 Valleys domain and it also served to be a wonderful opportunity to finally nail down the skibike friendliness of the area. We had both good and bad days weather wise, but on one of the good ones we managed to hit all the 3 Valleys in a single day and on another I managed to achieve my ambition of finally seeing Orelle after 20 years of trying. So what of the positive aspects of the 3 Valleys? It is has an unrivalled scale you are spoiled for choice with so many permutations. You could spend weeks running over the area and still find runs that you've missed. The infrastructure is excellent quality and is continually being upgraded, it is unusual to find queues or bottlenecks outside of peak periods. You could spend weeks and still find runs that you've missed. I would like to report that it was all plain sailing, but sadly that is not so and I have been left with the lasting impression that it was somewhat of a bitter-sweet experience. Oddly, on the last day of my trip the lift operators at Les Menuires began to hamper our progress. 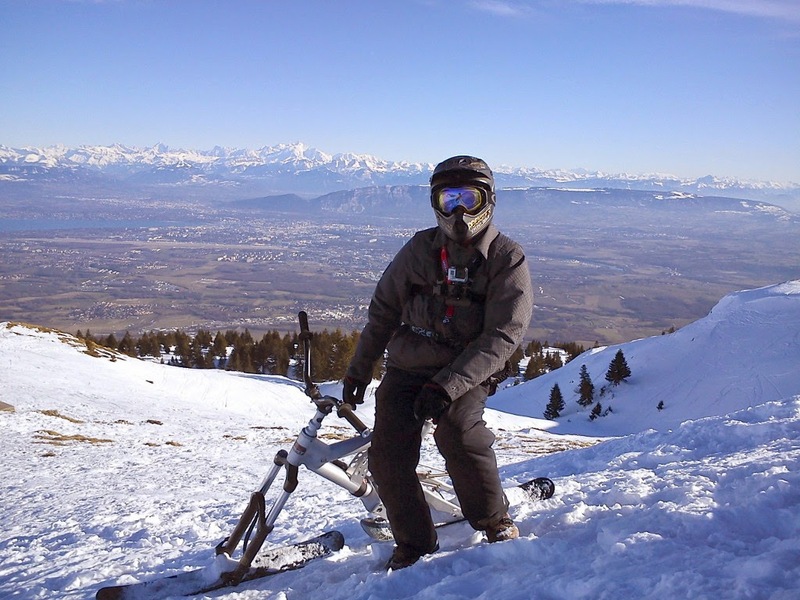 Even though John has been quietly skibike riding here for the last couple of months and last season too; it appeared that with the arrival of the Easter break, suddenly "Rules is Rules" became the lift operating company's new mantra. As far as I can work out the lift operators at Les Menuires and St. Martin de Belleville have boxed themselves into a Cul de Sac. 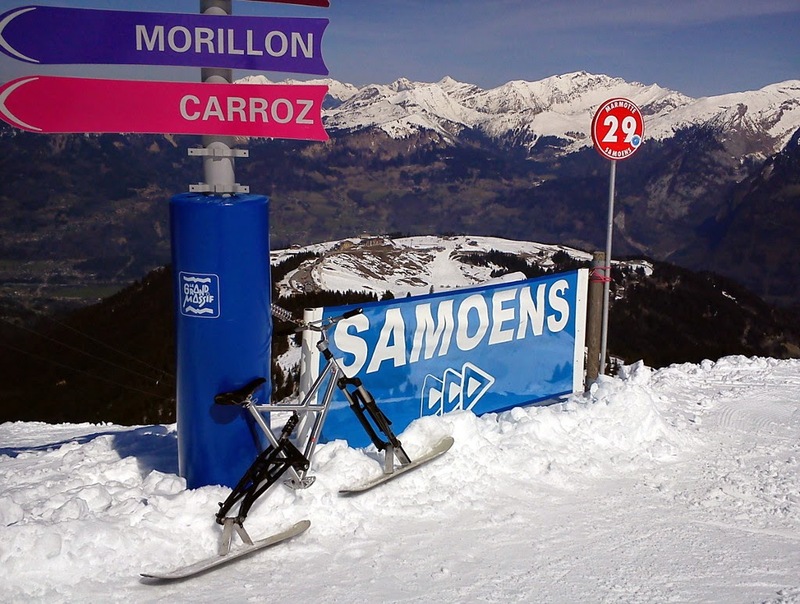 They decided that both skibikes and SnowScoots are permitted on the infrastructure, meanwhile the local council has ruled that any device with a saddle isn't permitted to use the slopes, with the sole exception of disability devices, oh and sledges (provided the lift company supplies them of course). This leaves the lift company in the awkward position of back-tracking and deciding that only skibikes without are saddle are allowed. 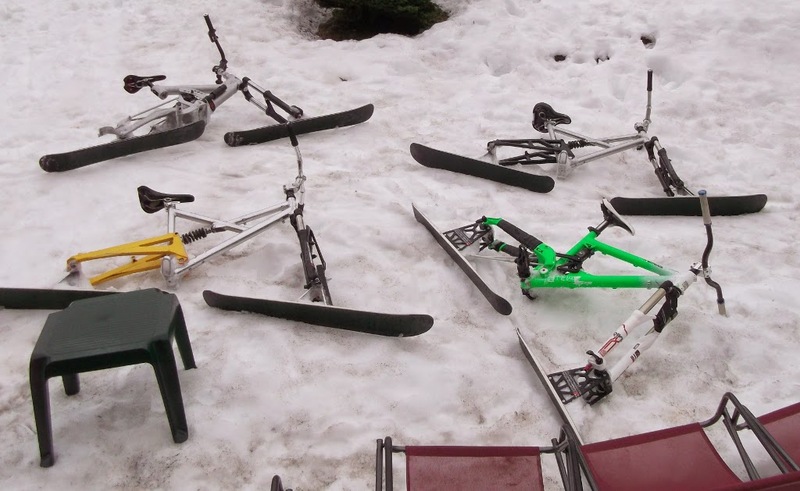 As far as I am aware, there isn't and nor has there ever been a skibike made without a saddle and that includes all the skibobs going back to day one. I suspect that someone from the council has heard about skibikes on the slopes and as a result they are now enforcing these complex and contradictory regulations. Poor John's base camp became distinctly skibike unfriendly overnight, am I really to blame? I am hoping that maybe Thierry, on behalf of the Aravis Skibikers, can put on a charm offensive and try to improve the situation for next season, things usually progress far quicker when the natives push for change, rather than all us crazy foreigners what with our weird skibikes with saddles and all. Without wanting to dwell on the negative aspects of the 3 Valleys, I also have a gripe with the complex and inequitable price structure of the lift tariffs. By mistake, I bought a pass that only covered Les Menuires, not realising that Val Thorens, just minutes up the road and in the same valley is on a completely different tariff. I needed an extension to access Val Thorens and expected the price to be the difference between the two tariffs, but no, you have to pay considerably more. In my case the extension alone was approximately €30 and that was on top of a €44 ticket, what a rip off! This is most certainly not an equitable arrangement in my books, but has served to teach me that in such an interlinked domain you shouldn't mess about buy the full 3 Valleys pass regardless of whether you are likely to need it or not to avoid a costly error.